I love my smoothies, and in fact I often make a protein enriched banana oatmeal smoothie for breakfast almost every day. I also try to create a super green smoothie each day as my daily snack. Although I love my usual smoothies which are both nutritious and tasty, the same old thing does get a tad boring day after day unless you add something new into the rotation. 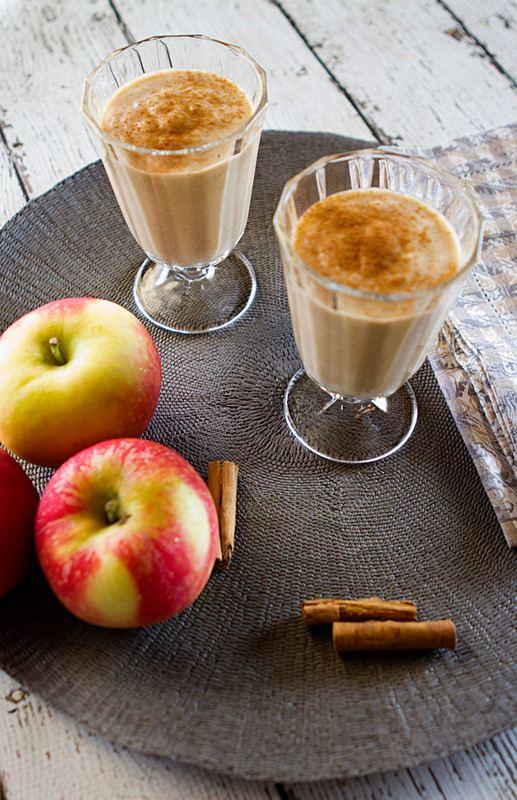 With the onset of fall, I started to experiment with some fall fruit to create apple, pear, and pumpkin smoothies and am thoroughly enjoying the new flavors. I always make my own applesauce or apple compote because applesauce is not sold in Italy as it is in the US. 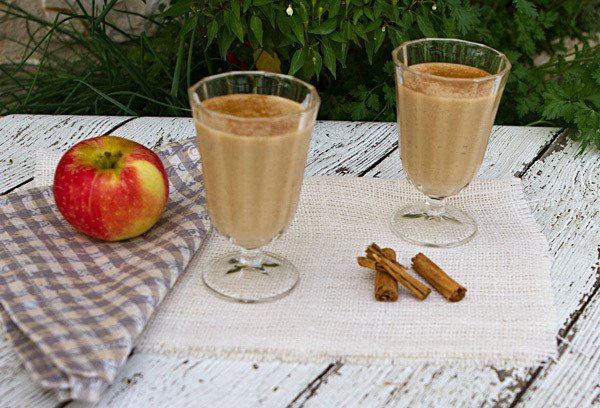 I had a container of unsweetened cinnamon spice applesauce in my freezer that I decided to use in this smoothie; that tastes just like apple pie. You can use cinnamon applesauce, or the regular variety, whatever you have on hand, but if using regular, you will need to add in about a half teaspoon of ground cinnamon. 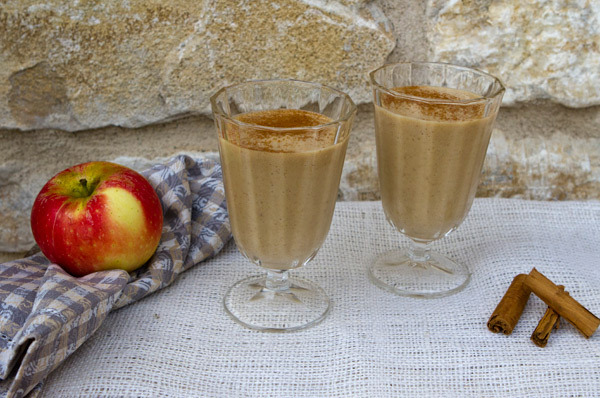 I used just a teaspoon of date paste to sweeten my smoothie because my apples were already quite sweet, but you can skip the date paste, or add a teaspoon of honey instead if you prefer. Because this smoothie was my breakfast and therefore a meal replacement, I added a scoop of vanilla protein powder, but if you are making this as a snack, you may want to eliminate this ingredient. I always keep a supply of very ripe bananas in my freezer to use in my smoothies. Frozen bananas help to thicken smoothies and give them body, but if you do not have frozen bananas, simply add a few ice cubes. Fruit based snacks such as this one add nutritional value to a meal and are not simply empty calories but are very satisfying and delicious. 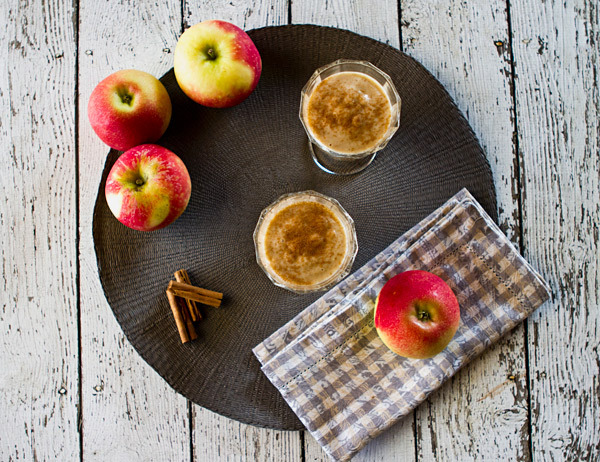 These smoothies are lightly sweetened with date paste to allow the natural sweetness of the fruit to shine through. Throw all the ingredients into a high speed blender and puree until thick and smooth. Garnish the top with a sprinkle of ground cinnamon.